Elizabeth Welcome and daughter Ryliegh Pereira, 2. Her second child will get free diapers thanks to employer incentives. With a baby on the way in February, Elizabeth Welcome has a long and expensive shopping list: clothes, bottles, a crib, a stroller. But she’s not worried about buying diapers. 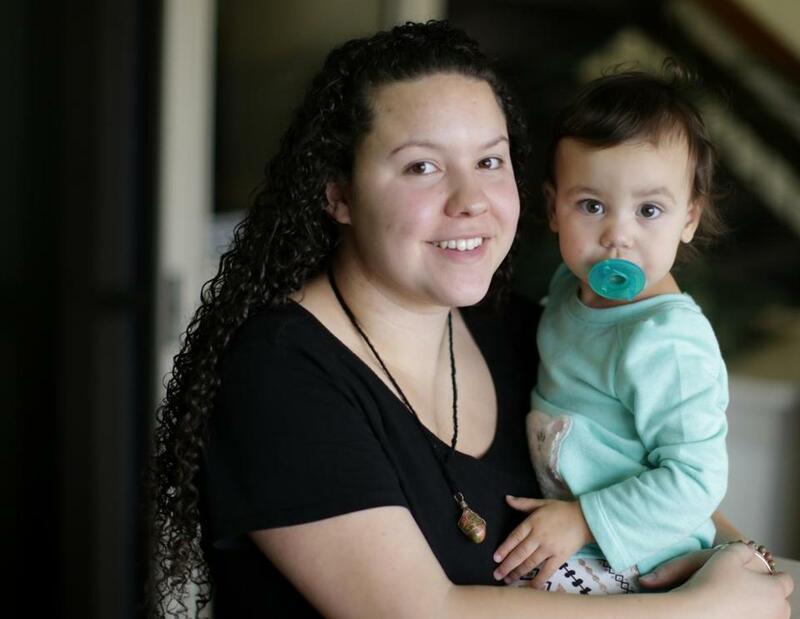 Welcome plans to deliver her baby at a community hospital instead of a higher-priced Boston teaching hospital. The decision is expected to save thousands of dollars for her employer, which pays most of her health insurance costs. As a reward, the company has promised to buy two years’ worth of diapers and wipes. State data show that the price of maternity care and other medical services can vary by many thousands of dollars from one hospital to another, and that price differences are not tied to quality. A commission has been assembled to study the issue. But some employers are seeking to exploit the price discrepancies, offering cash and other incentives, such as free diapers, to encourage workers to choose lower-cost health care services and providers. When employees choose less expensive options for common services such as lab tests, colonoscopies, MRIs, physical therapy, and maternity care, their employers and health insurers can save hundreds or thousands of dollars per service. Employees may be able to save on their share of medical costs, as well, while pocketing sometimes lucrative rewards. Over time, if enough people shop around, the lower-cost claims can put a dent in rising health care premiums, employers said. Over the past few years, many insurers and employers have launched websites that estimate the costs at different providers, to allow consumers to shop around. (Massachusetts insurers are required to put this information online). But the sites are rarely used. Houpt and others said that such rewards (carrots) can be more successful than just moving employees into high-deductible or tiered health plans that force them to pay more out of pocket for expensive hospitals (sticks). Welcome works in customer service at Phia Group, a Braintree consulting firm that helps employers reduce health care costs, often testing new ideas in-house first. CEO Adam V. Russo offered the diaper perk last year to encourage employees to consider lower-cost hospitals. At Jiminy Peak Mountain Resort, a ski resort in Hancock, executives are giving $100 to employees who choose lower-cost settings for routine tests, and even some surgeries, such as cataract and tonsil procedures. “When it’s all said and done, they get $100 back because they’re saving the company money,” resort owner Brian Fairbank said. “An MRI is an MRI, whether you get it done at the hospital or an imaging center,” he said, though hospitals tend to charge more. Cash rewards work best for employers that carry the insurance risk for their employees and pay claims and set premiums themselves (as opposed to employers that use insurance companies for those tasks). Businesses with cost-saving incentives say they have to spend many hours educating employees about the complexities of health care pricing, so employees are comfortable enough to shop around for care. Vitals’s SmartShopper program compiles a list of facilities for routine services. When they pick cost-efficient facilities, patients earn rewards ranging from $25 to $500. For a lab test, total savings could be a couple hundred dollars. For surgery, it could be well over $10,000. The savings have added up at organizations like HealthTrust, a Concord, N.H., benefits provider for 47,000 public employees. HealthTrust said it saved almost $1.7 million in the first nine months of this year, even after paying employees $218,000 in rewards. Many experts say the ability of consumers to shop for some care is important for bringing health care costs under control. If enough people switch to lower-cost providers, the thinking goes, it will reduce spending and put pressure on expensive facilities to lower prices. But some worry that price shopping makes it more difficult to coordinate a patient’s care and could disrupt relationships between patients and their doctors. For some, the rewards can be significant. Mary Burkhalter, a paralegal at Phia Group who works from home in Louisiana, considered two facilities for weight loss surgery. Though the same doctor would be performing the procedure, the price difference was a hefty $18,000. Burkhalter, 53, took advantage of another unusual employer perk. When she uses medical facilities that save the company money, she gets a check for up to 20 percent of the savings. She and her husband both had the gastric sleeve procedure. They have been losing weight and feeling healthier — and they got a reward, after taxes, of $4,300. It comes at a good time: They are preparing for some home renovations and plan to send their son to college next year.